Spring is finally here. Trees are blooming with color, you can feel the warm kiss of the sun, and the wildlife is abuzz with activity. People get more active in Spring too. We want to get away from the homes that we have hibernated in over winter and explore the parks, lakes, and scenery around us. 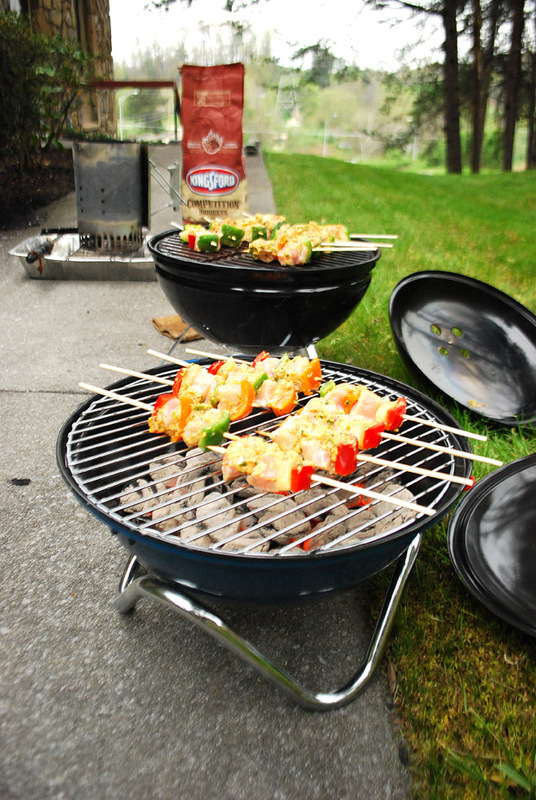 Grilling should be a part of that fun, it makes recreation better! I am sure you can easily think of a time when you were enjoying yourself at a park or near the water. Things were fine, you have had a lively day so far but then someone nears you fires up a grill and starts cooking out. The aroma of the charcoal and the sizzle of the grill made you wish that YOU were also grilling. Does this grill make my butts look big? But I also wanted to grill a little something on site just to make it a little more festive. I made it "take your grill to work day"! 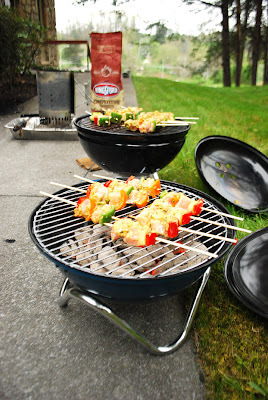 I grilled some simple chicken kabobs on my portable grills at that office. 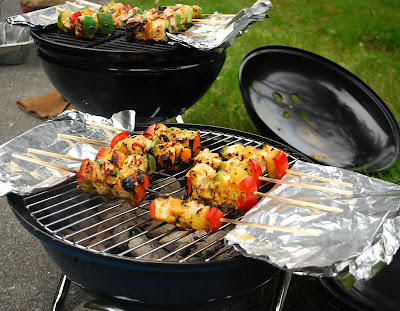 The foil is to help keep the skewers from burning. Keep It Simple - Keep It Fun! That's the whole point, isn't it? While it might be tempting to "wow" the crowd with your grilled beef wellington, you will have more fun if you plan a simple menu with items that don't require a lot of on site prep and that have short cook times. I like things like burgers, dogs, sausages, pork chops, fish fillets (for guests, not me), and chicken pieces. Prep Ahead. Anything that can be done ahead of time at home will mean less utensils to take, less trash to deal with, and more time to spend socializing at the cookout. For example, I cut my veggies, chicken, made my marinade, and assembled the kabobs at home. I put them in a plastic container and poured the marinade over them, so all I had to do at work was grill them. BYOG - Bring Your Own Grill. The installed grills at most parks are a last resort. They are designed to withstand abuse and the elements. Generally they are inefficient, ornery, and not well maintained. You are better off bringing your own portable grill. I like ones like the Weber Smoky Joe because it's inexpensive ($30), fits easily in a car trunk without disassembling it, and it has good airflow control. I have had self contained units like this one and they are easy to use and transport. There are some interesting folding notebook style grills like the one Adam Perry Lang uses in this video. Generally I avoid the prepackaged all-in-one disposable grills because the three I have tried were not very effective and the "coal" was poor quality. Front is a Bodum. Back is a Smoky Joe w/ Craycort 14.5" grates. Know The Rules. 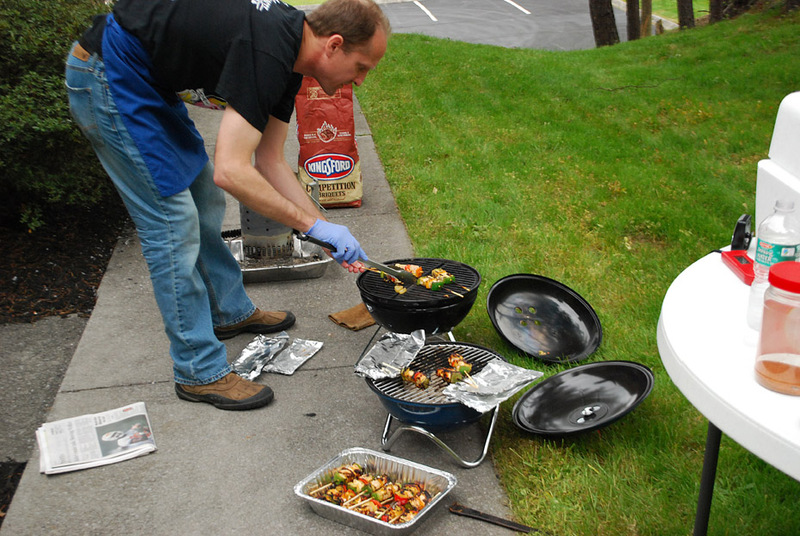 Many parks and recreation areas have grilling rules including specified areas, ash disposal, and seasonal bans. Find out the rules before you go so you aren't surprised with getting shut down mid-cook and/or getting a citation. That's probably not much fun. Sanitation. You most likely won't have a hand wash station with hot water available. My first line of defense is taking and using nitrile gloves, lots of them. Take as many as you THINK you'll need and double that. I also put 1 Tbsp of Clorox bleach in 1 gallon of water as a sanitizing solution (200 ppm) and leave that in the car. Then when I need it, it's warm from the heat in the car. A Tale of Two Coolers. Speaking of sanitation, you will probably have cold raw ingredients (your meat, veggies, etc) and cold ready to eat ingredients (condiments, side dishes). I like to take two separate coolers to avoid any possibility of cross contamination. Gimme Shelter. Some parks have covered eating areas. Check ahead, some around here are reservation only, others are first come first serve. Pop up canopies like the EZ-Up are great for providing instant shade and cover. If none of these are available, look for natural shade. Get It In Gear. Think through WHAT and HOW you are going to cook and serve on site and take note of all the gear you will need. The basics include an instant read thermometer, tongs, spatula, heat resistant gloves, charcoal starter and serving utensils. But think about what you plan to do and make a list. KEEP IT CLEAN ! ! Nothing is more selfish than to go to a park or recreation area to enjoy the scenery and atmosphere and then tarnish that area for others by leaving your trash behind when you leave. Double and triple check your area when leaving to make sure that you have left no sign that you've been there. What about Tip #10? I thought I'd let YOU fill that one in. 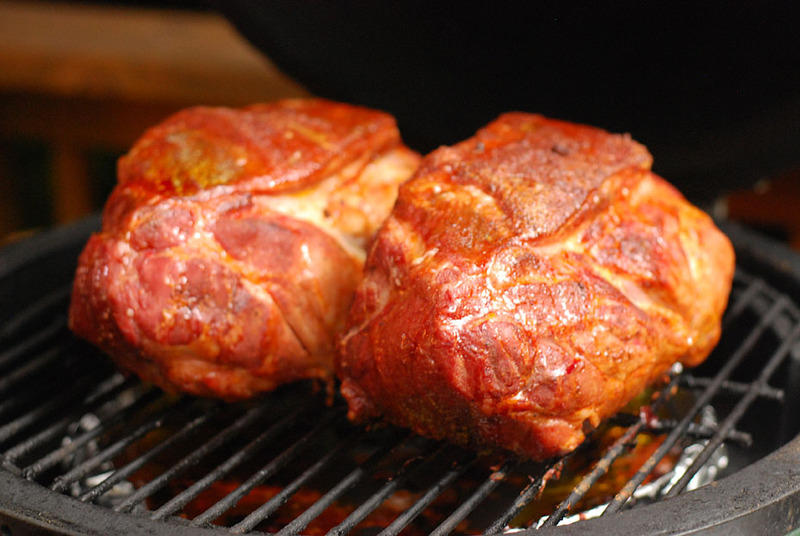 What is your best trick/tip for grilling or cooking away from your home?